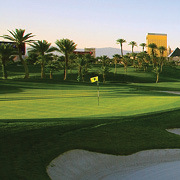 Take your shot at the only championship golf course located along the Las Vegas strip. This South Pacific inspired course measures over 7,000 yards from the back tees and will challenge the skill of even the best golfers. It is one of the most unique and enjoyable courses in the world with amazing views of the Las Vegas Strip from fairways to tees. We’ll take care of all greens fees, cart fees, and unlimited practice balls. Bring your own clubs or let us know if you need a rental set. The golf outing activity is now full. If you select this activity, you will be added to a wait list. If a spot opens up, you will be alerted. Transportation: Meet at the valet entrance outside the hotel lobby (Level 1, West End Tower) at 11:00 am and ride over to grab lunch at the golf club before our 12:30 p.m. shotgun start. We’ll be back to the hotel by 5:30 pm. Put your minds and problem-solving skills to the test in these real-life escape games. Do you have what it takes to crack the clues, solve the puzzles, and beat the clock? Escapology is the perfect way to get to know and have some fun with your fellow conference goers. You can choose from one of seven escape room themes, including Cuban Crisis, Th3 C0d3, Shanghaied, Budapest Express, Antidote, Mansion Murder, and Narco. 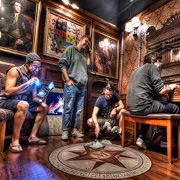 Once on site, you’ll be divided up into groups of six to find the clues and solve the mysteries. We’ve reserved the entire Escapology venue for three hours, and lunch will be catered. Transportation: Meet at the valet entrance outside the hotel lobby (Level 1, West End Tower) at 10:45 am for a 15-minute ride down the strip to Escapology. We’ll finish up around 2:30 pm and return to the hotel. Get your conference week off to a super-fast start with a dose of high-speed adrenaline. 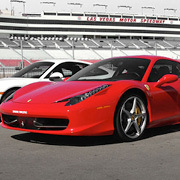 We are going to head west to the Las Vegas Motor Speedway. You’ll get some training and then get behind the wheel of one of the world’s fastest, most powerful supercars and take four exhilarating laps around the 1.2-mile track, reaching speeds of more than 100 miles per hour. For car lovers, it’s an experience that will get your heart racing. Please note that there is no catered lunch, but you will be able to purchase snacks and drinks on site. Participants must wear closed-toe shoes, preferably sneakers, and bring a valid drivers license. Transportation: Meet at the valet entrance outside the hotel lobby (Level 1, West End Tower) at 12:15 pm for a 25-minute bus ride out to the Las Vegas Motor Speedway. We’ll finish up around 4:15 pm and return to the hotel. If you want to see the sights in and around Las Vegas, there’s no better way than taking a Pink Jeep Tour. This was the most popular activity during our last trip to Las Vegas. This year, we are heading 45 minutes east to the historic Hoover Dam, a wonder of architecture and engineering that was built more than 80 years ago and towers 726 feet high over the Colorado River. 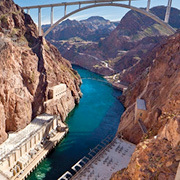 On this tour, you’ll see panoramic views of Lake Mead, the largest man-made reservoir in the United States. We’ll start with a 90-minute cruise and grab some lunch aboard a paddle wheel boat on Lake Mead. After lunch, we’ll take a fully guided tour of the Hoover Dam. We’ll make sure you have plenty of water for your trip. Just be sure to wear comfortable shoes. Transportation: Meet at the valet entrance outside the hotel lobby (Level 1, West End Tower) at 10:45 am and board the famous Pink Jeep Tour Trekkers. The tour of Hoover Dam and Lake Mead will conclude at 3:30 pm, and we’ll be back to the hotel around 5 pm. Make plans to arrive in Las Vegas in time for our private Welcome Reception at Madame Tussauds of Las Vegas. We’ve reserved one of Las Vegas’ top event venues. Meet the legends of Las Vegas, like Elvis, Bugsy Siegel, Wayne Newton. You can party with the Wolf Pack from The Hangover or hang out with the original Rat Pack. Take a selfie with music legends and Hollywood celebrities like Dwayne “The Rock” Johnson, Bradley Cooper, Beyoncé, Gwen Stefani, and Katy Perry. How to get there: Madame Tussauds is about a one-mile walk from The Cosmopolitan. It’s about a 15- to 20-minute walk going past the Fountains of Bellagio. Or you might want to take a ride share or taxi and get there in about 5 minutes via South Las Vegas Boulevard. Carmine’s is a family-style restaurant offering exceptional value to its guests through the many dishes of Southern Italian cuisine. Think lots of great food, in a fun, relaxed environment. At Carmine’s you’ll enjoy an amazing meal and still carry on great conversations. Restaurateur Artie Cutler crafted Carmine’s with a singular vision; bringing his guests “wow-factor” sized portions and making any meal feel like an Italian American wedding feast. 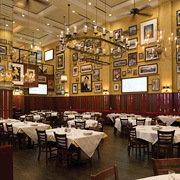 How to get there: Carmine’s is located inside the Forum Shops at Caesars. It’s about a 5- to 10-minute ride by taxi or ride share service from The Cosmopolitan. You can walk there in 15-20 minutes. 3500 S Las Vegas Blvd. This will be the perfect way to cap off our time together. 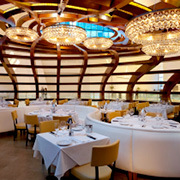 One of the more unique dining experiences in Las Vegas, Mastro’s serves up the finest steaks and seafood in a stylish sculpted ‘treehouse’ structure that rises from the center of The Shops at Crystals. Mastro’s delivers a memorable experience and has something to offer for every palate. How to get there: The Shops at Crystals is located across Harmon Avenue just outside of the Aria. The easiest way to go to Level 2 of The Cosmopolitan and take the exit to the Harmon Avenue bridge that will take you directly to the Shops at Crystals. Once you exit The Cosmopolitan, it’s a 5-minute walk to Mastro’s. We wouldn’t recommend a car for this distance.